2/10/18 – Pretty Stella has found a home! 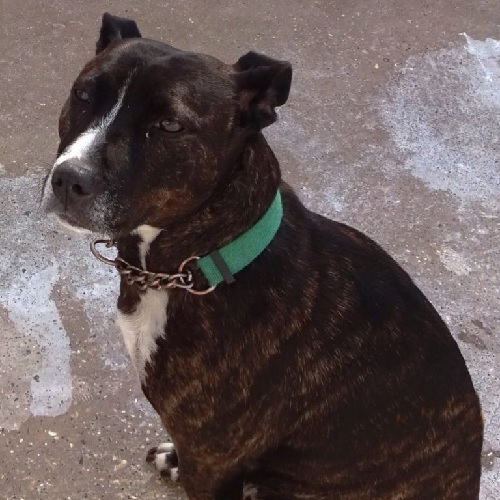 Stella is a sweet 7 year old Staffy girl who is at Ark Animal Rescue and Retirement Home on the Lincolnshire coast. Stella hasn’t had the best of times and has been mistreated in the past, which has left her a little scared and trembly at the moment. Yet despite the bad times, Stella remains a lovely, friendly girl who deserves a wonderful new home. Stella had been in her recent home since she was a puppy and she belonged to her mum’s ex-partner. Her mum can no longer give Stella the care and attention she needs due to her working hours, and so poor Stella has been living outside and her mum wants a better life for Stella. Although she was a bit scared initially, Stella wanted to be friends with her new carers at the Ark and she responds to a gentle approach. She just needs a little time to get used to things. Stella doesn’t like fireworks or wind and will back away from water. Very importantly, she doesn’t like her back end and sides touching. This probably stems from the mistreatment she had in the past and so care must be taken around her back end. She has not been spayed yet as she has had lots of phantom pregnancies – her last season was in July ’18. She is up to date with her vaccinations and is fit and well. 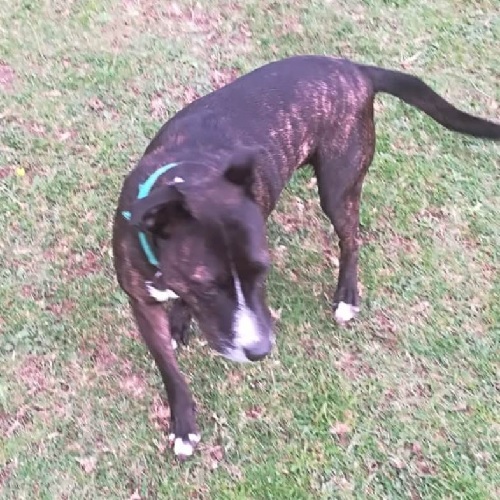 Stella lived with children aged 3-15 years and was good with them, but because of her back-end sensitivity she can’t be homed with young children. She lived with a cat short-term but would chase it. She has not lived with another dog but is fine with most dogs other than dominant dogs who she will show her teeth at but not follow through. Stella can be grumpy around food and she hates being touched by the vet and has to be muzzled, but she is fine in the waiting room. As she has been kennelled outside, Stella’s house-training may need some work and it’s not known how long she can be left. She travels well in the front footwell of the car. Her lead walking needs work but she will listen and wants to learn. She is good off the lead and her recall is good provided there are no distractions. She’s not particularly interested in toys but enjoys a game of tug. 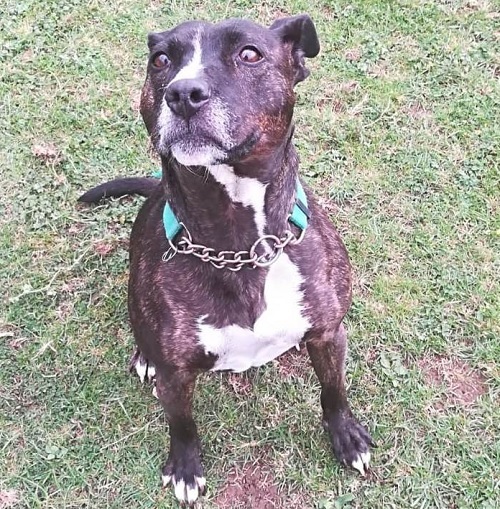 Stella has been through a lot in her 7 years and she now needs a loving home with people who have the time to devote to her and give her the love and care she deserves. Please mention that you saw Stella on the Oldies Club website.